One of the reasons I love going to watch soccer matches in Cary, North Carolina is because of the on the pitch seats. It's a really fun place to watch the match. This time I was there to watch the NC Courage and it was pretty dang awesome. The Courage were the runners up in the National Women's Soccer League last year and, judging from last year's trip to see NCFC, the Courage draw as big a crowd as the men. And that's the way it ought to be. This sport has been more of a women's sport in the US for years and it's great when people are there for it and the stands are filled with girls looking up to women proving that they can succeed better than the men. The first half was all about the Courage. Every pass went home and the Courage kept the Utah Royals' goal under siege. The Courage's first goal came when a corner kick was bounced out away from the goal and Merritt Mathias smashed a long distance seeing-eye ball through everybody, off the top bar, and into the goal. The second half was a different story. The Royals obviously made adjustments during the break and they absolutely dominated for the first 35 minutes. The Courage played like they were flustered and two glaring mistakes on their part gave the Royals a 2-1 lead. The first Royals goal came when a Courage defender headed a ball toward the goal over her own goalie and a Royals player tapped it in with her head. The second came when the Courage's goalie kicked a ball right to a Royals player and got it kicked right back past her. Then, in the 80th minute the Royals goalie made her own unforced error. She charged out - way out - to try to kick the ball clear. She wiffed and the ball deflected directly to a Courage player who made a soft kick into the net. After that things settled into "this is going to be a tie" mode. Both sides played well enough and the Royals made a decent shot on goal in the last couple minutes, but neither side got the momentum going. In the end, it was a 2-2 tie. The Royals seem to be specializing in these and this was their third tie of the season. On the other hand, the Courage are still the only team with a winning record in the NWSL. The NC Courage mascot vamping before the match. This guy kept running in front of my seat and partially blocking my view. Three years ago, the Carolina Mudcats were one of the first bucket list teams that I went to see. That time, I left when the game was interrupted by a rather intimidating lightning storm. Standing on the concourse, I heard one of the kids working the game tell his fellow employees that the game was called, but they weren't announcing it because they didn't want people to leave while the lightning was a danger. I left anyway, and when I got back to my hotel room and turned on MiLB.tv found out the game had been resumed. So, this year was try two. As I drove to the Raleigh/Durham/Cary area that day the temperature (per my car's thermometer) got over 80 degrees. I showed up at the stadium in shorts and a t-shirt. As I got out of my car a hefty wind kicked up. I swear, in the next twenty minutes the temperature dropped 10 degrees. I bought a jacket at the team store, but should have probably gone for the blanket everyone else was getting. The wind was everywhere and came from all directions. The moment I thought I'd found a place where I could get some shelter it changed directions. And it got colder and colder. Finally, half way through the 5th, I was done. It was either leave or watch my fingers turn blue. Buies Creek was winning and looked to have the game under control. It may have been fortuitous that I left when I did because as I was driving out (car thermometer now saying 49 degrees) fireworks went off signifying a homerun and the Mudcats took the lead. If I'd stayed long enough to see that I might have stayed for more of the game and I'm not sure if I'd have survived the hypothermia. BTW, for those of you who think I wussed out, well, I did, but I made it longer than 90% of the crowd. From about the third inning onward there were far more employees in that stadium than there were fans. So, now I have to figure out how to get back to see the Mudcats again. It'll probably be next year. I'll be able to combine seeing it with a trip to see the new team in Fayetteville. I will see a complete Mudcats game eventually. They have a cool theme and they put on a good show and Mother Nature can't run me off every time. Just watched Greene pitch in Wednesday's game against the South Bend Cubs. The good news was that he looked like he was more in himself and not pushing overly hard like he was in the first game. He got his fastball up to 101mph (tying Chapman's record for speed at Dayton), but he hit the batter with that pitch so I'm not sure it's something to brag about at this point. He was working on his inside-outside placement of pitches and doing better with it when he was using breaking pitches. In fact, he was pitching better with them than he did with the fastballs. The fastballs seem to be coming in a little too straight and predictable; single A batters aren't having too much trouble putting wood on them. In the first game he seemed to have a rising fastball that worked, but it didn't show up this time. He also seemed to have a high breaking pitch last time; it only showed up a couple times in this game. In the end, his breaking stuff looked more effective than his fast pitches. 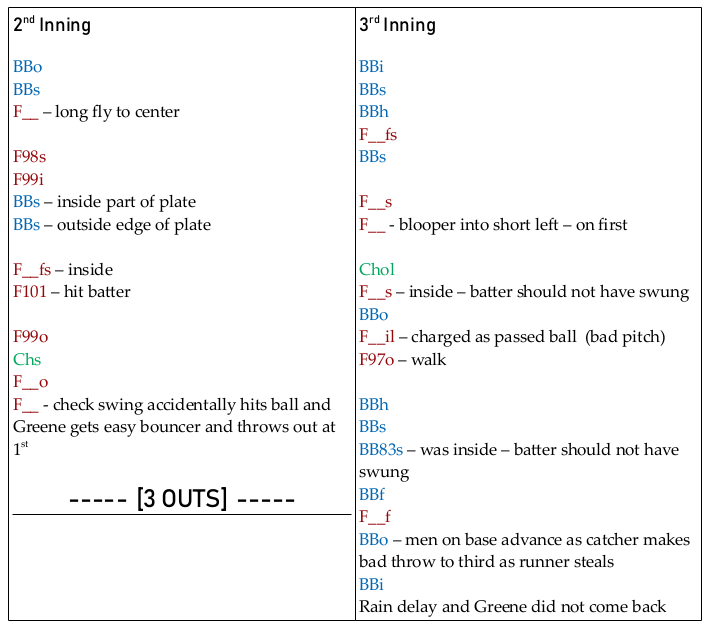 When the rain got bad in the third inning, Greene got flustered and that led to the rain delay and his removal from the game (he was near his allotted pitch count if not over). All that said, he's a pretty solid single-A pitcher. That means he still has control issues. However, it's encouraging that they are having him work the inside and outside of the plate. I take that as evidence they aren't going to try to just make him into a Chapman type hurler. I'll be more impressed when they get him working the top of the strike zone as well as the bottom. His fastballs need help. They're entirely too hitable. If they can get that ball to hook a little or rise above a swinging bat this guy might just become unstoppable. But that's all in the future. He needs time to settle, adjust, learn, and grow. Hopefully that means he'll get a full season in Dayton before being skipped over the useless FSL and moved directly to AA Pensacola. In the meantime, expect sporadic reports here. Below is a break down his pitches as best I could. Baseball came back to Kinston NC last year. Because you can't name your team after any group unless they are Eurocentric (Vikings, Knights, Irish, etc. ), they didn't start back up as the Kinston Indians; they started up as the Down East Wood Ducks. It's a shame because the Indians' "K" logo is better than the Wood Ducks' logo. However, the Wood Ducks are clearly all in on the new logo. In any event, The Wood Ducks were facing the the Myrtle Beach Pelicans on this fine day and both sides had some of their top prospects playing, although it was a bit dissappointing that the #2 prospect for the Texas Rangers was only DHing. For the Wood Ducks, Taveras (#2 Texas prospect) had a not-so-good day at the plate going 1/4 with 2 strike outs and no walks. On the other hand, Tejeda (#27 Texas prospect) had a really solid night at the plate going 2/3, getting a double, scoring once, and getting a walk. The Wood Ducks' pitcher, Matuella (#30 Texas prospect) got shelled. He left the game after 3+ innings and 7 hits, 3 strike outs, 3 walks, and 7 runs. The Myrtle Beach Pelicans' pitcher, Hudson, didn't do too much better despite being a higher prospect in his organization (#13 Cubs). He left after 5 innings and 5 hits, 4 strike outs, 1 walk, and 3 runs. To be honest, at least on this night a good portion of the difference was the fielding - not the pitching. Aremis Ademan, the Cubs #1 prospect was at short and his play there was sharp. The Pelicans' fielding was sharper than the Wood Ducks overall and Ademan seemed a step faster than his teammates. At the plate he went 2/5 with one of the hits being a home run (however, do not give too much credit for that - in the 9th inning the Wood Ducks' manager put his 1st baseman in to pitch and Ademan tagged a slop-ball). He scored twice, struck out twice, and batted 1 run in. I make it a pretty good probability that Ademan will be at the Smokies before the end of this year. The Wood Ducks' stadium is an old style stadium that has been updated somewhat. If you've gone to a game in the Appalachian league at Burlington, Princeton, or Bluefield you've seen this type of field before. It's a solid field without all the unused bells and whistles that you find at so many modern minor league parks. It also has some of the flaws of the older fields. Don't buy tickets in the reserve section. To be honest, you can see the game better from the cheap seats. They've done the truly bad thing of selling all the seats close to field in the reserved sections to corporate season ticket holders. This is bad in that it makes it look like the game is poorly attended (these type of ticket holders quite often leave their sections empty and most did this day) and it makes people like me who buy what they think are front row tickets (section 6 row A seat 12) not so thrilled. I left my seat before the game even started and went to sit on the grass embankment on the first base side. For those of you with more sense than me who show up early there are tables and standup bars out there which would be even better. The crowd was 2,500+ and they were into it. Kids were running everywhere. Every foul ball had a pack of feral kids in hot pursuit. The fans were chanting, clapping, and cheering the Wood Ducks on even after the Wood Duck manager had given up on the game and put his 1st baseman in to pitch the 9th inning. Which, BTW, was a pretty crummy thing to do in an early season game that wasn't going anywhere near extra innings in the season's first homestand in front of 2,500+ fans. Even if the manager just wanted to end a runaway game it would seem to make more sense to put in a regular reliever who wouldn't be throwing slop-balls, giving up hits, runs, and extending the game. In any case, if you are in the Kinston area you should go out and watch a game or two. These old stadiums are vanishing and being replaced with modern mediocrities. And, this is obviously baseball country. The fans love the game and put more passion into rooting for their team than I've seen in the vast majority of minor league teams I've visited. There may be no crying in baseball, but apparently there's prayer. While waiting for their new stadium in Fayetteville, the Astros have A+ team has been housed at Campbell University (The Fighting Camels). This is their second and final year there, so I made a trip down to catch a game. The BC Astros only had one of their mothership's top prospects playing at center field, Ronnie Dawson (#21 Baseball America). On this night he did well enough on defense, but went 0/4 in at bats. More interestingly, the Salem Red Sox had their #6 prospect pitching, Darwinzon Hernandez. He made it thru 5+ innings with 6 strike outs, 3 walks, and 2 hits with 1 earned run. He has an interesting delivery which appears to do a good job of hiding the ball at the beginning of his throw, but leaves him off balance and bouncing backward at the end of the pitch. It wasn't pretty, but he was effective. Below is an view of his style (amalgamated from a couple pitches). Of note, the BC Astro's starting pitcher kept pace with his opposite. Carson LaRue went 5 innings, got 6 strike outs, gave up 1 walk, 4 hits, and 0 runs. In the end, after the two starting pitchers left Salem's offense proved too much for BC. The two other prospects on Salem didn't do much at bat (Netzer[#18] 1/4 hits, 0 BB, 0 SO - Dalbec[#16] 0/4, 1 BB, 3 SO). The most impressive hit was a homerun by Chris Madera (center fielder). The final score was Salem 4 - BC 2. The Ump intervenes in the discussion over who's buying the beer tonight. 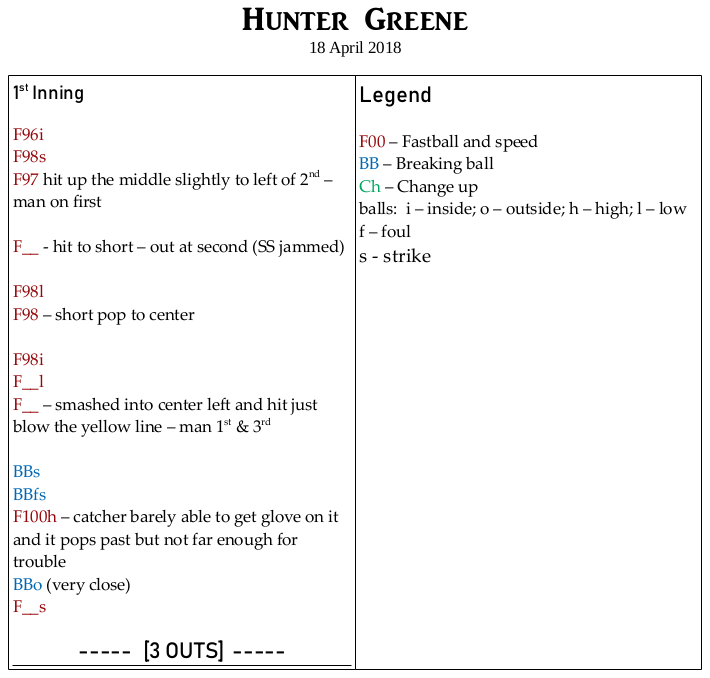 Y'know, I was really hoping that Hunter Greene would get assigned to the Greeneville Reds in both of their first years. It would have been worth it for the wordplay if nothing else. However, it looks like the Reds have made the proper choice when they assigned him to the Dayton Dragons. 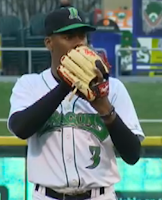 On Monday, I watched as Greene started for the first time for the Dragons against the Lake County Captains. He only pitched three innings, but those three innings were instructive. In those innings he got eight strike outs and gave up no walks, but he also allowed five hits and two runs. It was a mixed bag which showed a lot of talent as well as a need to develop his talents. To my eye, he got away with pitches that won't work at AA or above. He fooled a number of single A batters who pursued balls that ran out of the strike zone. He also seemed to have a tendency to pitch from behind, giving up two or three balls before coming back to get his strikes. I also think he was trying a little too hard - pushing to hurl the ball with velocity and losing control as a result. He was throwing fast balls and what appeared to be fairly good breaking balls. The fast balls seemed to come in two types. There was a fastball down which seemed often to go too low at a (maybe too?) steep angle (sliders?). There was also a fast ball high which seemed to rise as it came in and left batters swinging under it. The breaking balls seemed to vary in the amount of their breaks from ones that looped a little and still remained fairly high to ones that dropped rather severely. I didn't spot a change-up and don't remember the announcers calling one either. 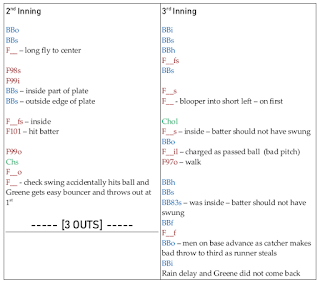 Most of his strike outs seemed to come from the breaking balls either getting over the plate or causing the batters to chase them out of the zone. The batters were clearly looking for his fast balls and I don't think they were prepared for pitches that broke. I want to see how Greene is doing in his fourth or fifth start. By that point he should have settled down and I expect his pitching will improve as he goes along. At the same time, there will be more video to study and batters should be better prepared for him. The batters seemed totally unprepared for his breaking stuff on Monday. A month or two in that should not be the case and we should get a better feel for exactly how good those pitches are. 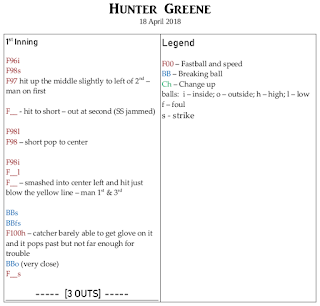 All-in-all, I'm sad to say that Hunter Greene is exactly where he needs to be to develop his talents and we shouldn't be seeing him in Greeneville at all this year unless he regresses in some manner that I do not anticipate. Hopefully he'll stay in Dayton for a year to eighteen months to develop and then move up to AA and start working his way up through the tougher leagues. There's a lot of potential here and, God willing, the Reds won't push him up too hard or too fast so that when he hits the MLB he'll be as good as he ought to be.